WEEKS 2, 3 & 6-9 ARE NOW FULL. *Please note that the date and price on your invoice will be incorrect. This is because you are in the Reservation Request. You will be moved to your week the following Tuesday, and your price will auto adjust to the corresponding week. The Camper Fees will be based upon the Session to which your reservation is assigned. The price will automatically adjust once your reservation is moved. The Rugged programs have a separate reservation that can be found on our website. 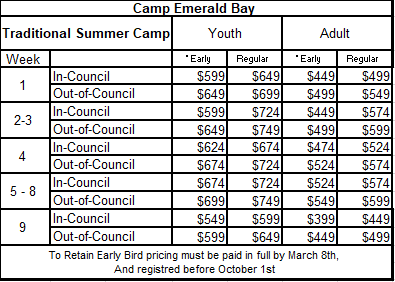 The cost of the Rugged programs are in place of traditional merit badge camp fees. To retain early bird pricing the entire registration must be paid in full by March 8, 2019. If the registration has a balance due after March 8, 2019 the cost will increase to the regular 2019 pricing. Any participants registering or added to an existing registration after October 1st, 2018 will pay Early Bird 2019 pricing (if the troop registered before October 1st, 2018). The cancellation policy will go into effect January 11, 2019. Any person cancelling/dropping will forfeit any money that is due on that date whether or not they have paid. January 11th, 2019 - $100 per participant(including adults) is due. March 8th, 2019- $200 per participant- Early Bird participants must pay the reservation in full. May 24th, 2019- Remaining balance is due. If you have any questions please feel free to check out some of our other helpful information. We have a NO REFUND Policy. Each payment is based on the total number of campers, not individuals. If there are any reductions in total numbers (Scouts or Adults) after each payment due date the troop will be responsible for the money due at the time of the cancellation, even if no payment has been made. Payments for cancelled spots are not credited to the troop balance if unit numbers are reduced. FINANCIAL AID IS AVAILABLE: Western Los Angeles County Council is proud to offer Camperships to WLACC units. The campership approval process is based upon Scouts Honor and is non-invasive. Please email camping@bsa-la.org to receive a campership form for your unit.